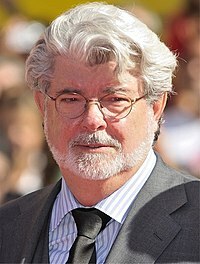 George James Walton Lucas (born May 14, 1944 in Modesto, California) is an American movie director, producer, and screenwriter most famous for his Star Wars and Indiana Jones movie series. He also directed the movies THX 1138 (1970) and American Graffiti (1973). He made the Indiana Jones series with Steven Spielberg. He is also an innovator for what he has done with special effects, and has founded companies that make not only movies, but also things like video games, theme park rides, and TV shows. Lucas founded the Pixar animation studio and later sold it to Steve Jobs in 1986 for $10 million. He has three children: Katie, Amanda and Jett Lucas (born 1993). Jett has had cameo appearances in Attack of the Clones and Revenge of the Sith as "Zett Jukassa". Lucas began dating Mellody Hobson, president of Ariel Investments and chair of DreamWorks Animation, in 2006. Lucas and Hobson announced their engagement in January 2013, and married on June 22, 2013 at Lucas's Skywalker Ranch in Marin County, California. A George Lucas Cultural Arts Museum was to be built in San Francisco, California, but after talks failed, Lucas decided not to build the museum in San Francisco. Soon afterwards, the Chicago Tribune reported that Lucas wanted to build the museum in Chicago, Illinois. Lucas said: "The city of Chicago has enthusiastically welcomed me and I consider Chicago to be my second home," Lucas said in a statement. "I look forward to working with community leaders to see if Chicago can become home to the Lucas Cultural Arts Museum. " The office of Chicago Mayor Rahm Emanuel confirmed that talks between the two were ongoing. A potential lakefront site on Museum Campus in Chicago was proposed in May 2014. On June 24, 2014, the Chicago Sun-Times reported that Chicago was selected as the location, pending approval of the Chicago Plan Commission. The commission approved the idea and the museum will be built in Chicago. ↑ Markoff, John (October 5, 2011). "Steve Jobs, Apple's Visionary, Dies at 56". The New York Times. Retrieved October 5, 2011. ↑ Kapos, Shia (December 3, 2007). "Taking Names: Stars in Chicago, but finding love elsewhere". Chicago Business. Retrieved May 19, 2008. ↑ Germain, David (May 18, 2008). ""Indy" survives Cannes critics". The Denver Post via AP. Retrieved September 26, 2010. ↑ "Red Carpet at the Golden Globes". The New York Times. January 18, 2010. Retrieved May 3, 2010. ↑ "George Lucas Engaged to DreamWorks Animation Chairman Mellody Hobson". The Hollywood Reporter. January 3, 2013. Retrieved January 3, 2013. ↑ Billups, Andrea (June 24, 2013). "George Lucas Marries Mellody Hobson". People. Retrieved June 24, 2013. ↑ "Crain's Chicago Business : Subscription Center". Chicagobusiness.com. Retrieved 2014-05-20. ↑ Mon, 05/19/2014 - 11:56pm. "Lakefront campus recommended for George Lucas interactive museum | Early & Often". Politics.suntimes.com. Retrieved 2014-05-20. ↑ Sneed, Michael (June 24, 2014). "Sneed Exclusive: Chicago to Get George Lucas Museum". Chicago Sun-Times. Retrieved June 24, 2014. This page was last changed on 27 January 2018, at 08:56.